If you've ever been in the situation to sit by the phone and wonder why he (or she) said he would call, but didn't, or if you can't figure out why he doesn't want to sleep with you anymore, or why your relationship just isn't going to the next level... he is just not that into you. For ages women were able to spend hours analyzing puzzling behavior of men. This movie will show the girls are wasting their time. Men are not complicated, although they'd like you to think they are. And there are no mixed messages. 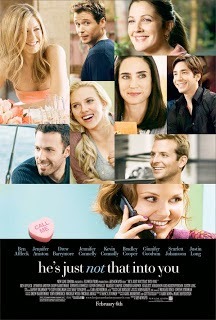 The movie tells the stories of a group of interconnected people as they navigate their various relationships from the shallow end of the dating pool through the deep, murky waters of married life, trying to read the signs of the opposite sexes and hoping to be the exceptions to the 'no-exceptions' rule. Gigi imagines every man she meets is Mr. Right; she gets reality checks from Alex, a sweet but cynical saloon keeper. Janine and Ben seem solidly married until he chats with Anna in a market checkout line; meanwhile Anna is indifferent to the pursing Connor. Neil and Beth have been together seven years; she dumps him when she realizes he really and truly isn't going to marry her. Does he love her? And Mary sells advertising while searching on line for a man. Will those in love stay in love? Will those searching figure out who is and who isn't into them? Are men all that different from women?